Mince garlic cloves Garlic should be as small as possible, in very fine pieces (about &frac18; in). Trim and quarter the mushrooms Remove the stems and cut mushrooms into four equal-sized pieces. Season the chicken with salt and pepper Immediately place the cutting board in the sink and wash your hands after to prevent contamination from raw meat. Heat oil in the saucepan over medium-high heat; swirl to coat bottom of pan. Add mushrooms; cover, and cook until softened, about 5 minutes. Add garlic, tomatoes, and oregano. Reduce heat to medium-low; cook, covered, until tomatoes have broken down, 10 to 15 minutes. 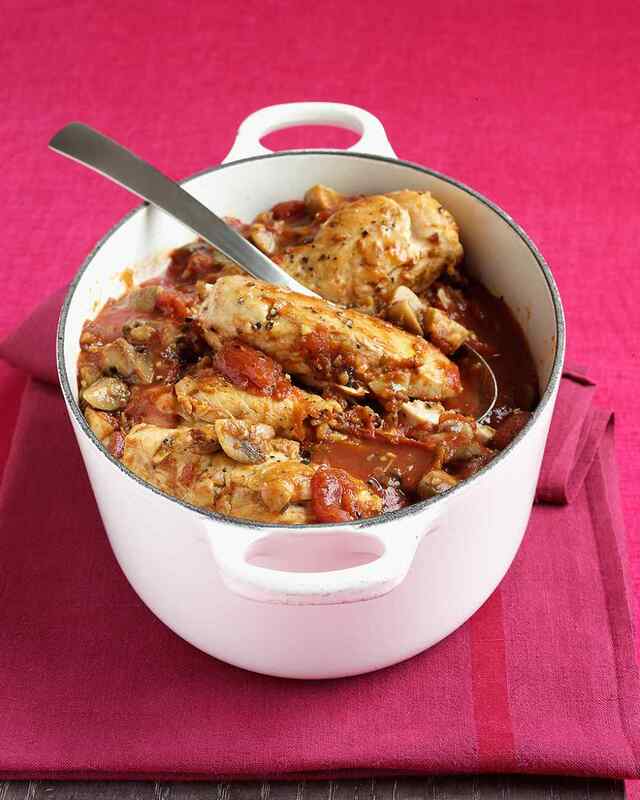 Return chicken and any accumulated juices to pan; cover, and cook until chicken is opaque throughout, 4 to 6 minutes. Turn chicken to coat with sauce, and serve.